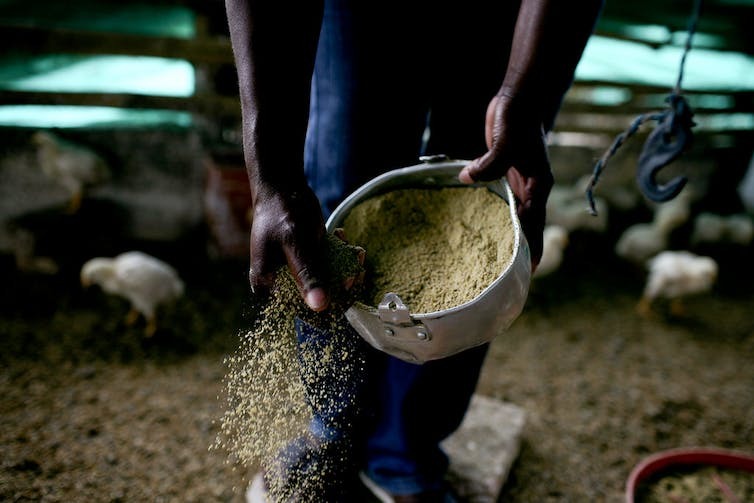 International migrants are key contributors to the unskilled workforce. Population growth has profound impacts on Australian life, and sorting myths from facts can be difficult. This article is part of our series, Is Australia Full?, which aims to help inform a wide-ranging and often emotive debate. Rather than being an unsettling force, international migrants are helping to provide stability to the regional Australian communities they settle in. A considerable number of new arrivals are also younger and have the potential to build families and work in these communities. Research with the Regional Australia Institute, examining the latest 2016 Census data, found 151 regional local government areas were helping to offset declining population in regional areas by attracting international migrants. We can see that, for many small towns, the overseas-born are the only source of population growth. A majority of these places rely on primary industry for economic viability. Although predominantly rural, these places are not in the most remote parts of Australia. Of the 550 local government areas we reviewed, 175 regional areas increased their population, while 246 did not; 151 increased their overseas-born and decreased their Australian-born population. Only 20 areas increased in Australian-born population and decreased in overseas-born population. We also found that 128 regional areas increased both Australian-born and overseas-born population. 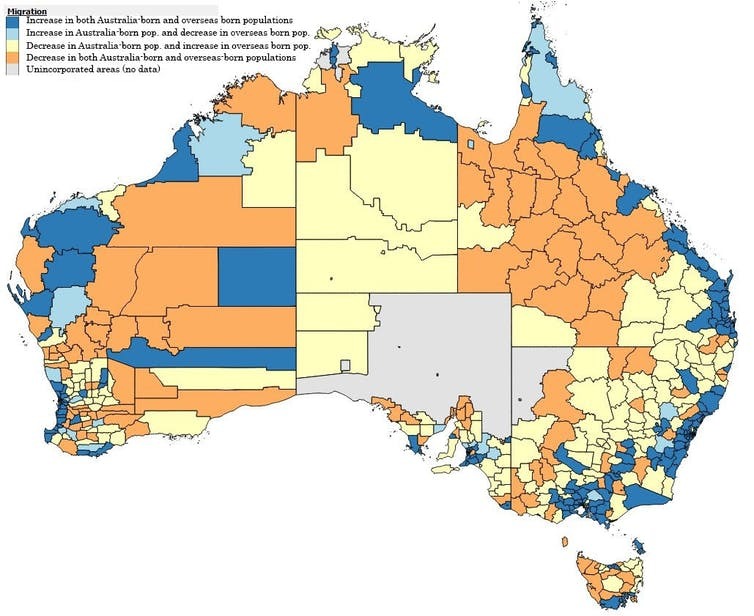 Another 116 regional areas decreased in both Australian-born and overseas-born population. Darwin is one example of where international migration has helped counter population decline. At the 2011 Census, Darwin had 45,442 people recorded as born in Australia and 19,455 born elsewhere. By 2016, the number of Australian-born locals had reduced to 44,953 and the number of overseas-born had increased to 24,961. Without this increase in overseas-born residents, the Darwin population would have decreased. The local economy would likely have suffered as a result. Ever since the influx of immigrants following the second world war, the settlement of international migrants has been overwhelmingly focused on large metropolitan centres. This has been especially evident for recently arrived immigrants and those from culturally and linguistically diverse backgrounds. Migrants perceive metropolitan areas as presenting a higher likelihood of finding compatriots and better access to employment, as well as education and health services. Large cities have therefore been considered the most appealing settlement locations, with Sydney and Melbourne the most popular. If settlement of international migrants had been proportional to the overall population distribution in Australia, an additional 125,000 migrants would have settled in regional Australia between 2006 and 2011. In a concerted effort to promote the social and economic viability of regional communities, in 2004 the federal government started a campaign to increase migrant settlement throughout different areas of the country. Regional settlement of migrants has since been encouraged across levels of government as a “win-win scenario” for new arrivals and host communities alike. In the past decade, there has been a particular focus on secondary migration to regional areas. That is, relocating international arrivals from metropolitan areas to regional ones. Proactive community-business partnerships and local government initiatives have propelled this process. For example, in the Victorian town of Nhill, the local arm of the poultry production company Luv-a-Duck worked with settlement service provider AMES Australia to help more than 160 Karen refugees find work in the area between 2010 and 2015. In another town, Dalwallinu in Western Australia, the population was in decline and local infrastructure was deemed underused. In response, the local council has worked closely with residents since 2010 to attract skilled migrants. Notwithstanding the challenges involved in attraction and retention, international migrants remain a vital asset for building regional economies and communities. They help stem skilled labour shortages in these areas – for example, by filling much-needed doctor and nursing positions. International migrants are also key contributors to the unskilled workforce, often filling positions that domestic workers are unwilling to take on. For example, abattoirs and poultry plants are important businesses in regional Australia. Many would be unable to operate without international migrants, as many local residents do not consider this kind of work “acceptable employment”. As a consequence of the various efforts to spread the settlement of overseas arrivals, the number of international migrants living and working in non-metropolitan Australia has increased. Between 2006 and 2011, 187,000 international migrants settled outside the major capital cities. Still, regional areas have remained underrepresented as a settlement location. Despite regional Australia being home to about one-third of the population, less than one-fifth of all new arrivals between 2006 and 2011 settled in a regional area. For regional areas to make the most of the many advantages migrants have to offer, there needs to be more focused policy that encourages and assists regional settlement across the country. This policy needs to be informed by the work in a growing number of regional communities (like Nhill and Dalwallinu) that already draw on international migration to combat population loss and persistent labour shortages. By encouraging more international migrants to call regional Australia “home”, we can start focusing on ensuring regional prosperity for the long term. You can read other articles in the Is Australia Full? series here. Outbreak of violence in Plateau state results in burning of 10 church buildings. LAGOS, Nigeria, January 27 (CDN) — Two pastors and 46 other Christians have been confirmed killed in the outbreak of violence 10 days ago in Jos, Plateau state in Nigeria, according to the Christian Association of Nigeria (CAN). In the religious clash, triggered when Muslim youths on Jan. 17 attacked a Catholic church, 10 church buildings were burned and 27 Christians are still missing, CAN officials said at a press conference in Jos today. Police estimate over 300 lives were lost in the clash. Kaigama said flashpoint areas where clashes have repeatedly occurred should be identified and security personnel deployed. Police said violence was triggered by an unprovoked attack by Muslim youths on worshippers at the St. Michael’s Catholic Church in Nasarawa Gwong, in the Jos North Local Government Area. Burned buildings included the Christ Apostolic Church, Assemblies of God Church, three branches of the Church of Christ in Nigeria and two buildings of the Evangelical Church of West Africa (ECWA), Christian leaders said. The ECWA on Saturday (Jan. 23) reported that some of its members were missing and appealed to security agencies to help locate their whereabouts. The Pentecostal Fellowship of Nigeria (PFN) accused the state General Officer Commanding (GOC), Major-Gen. Salleh Maina, and some soldiers of taking sides in the clash. “Soldiers were seen in some parts of Jos watching Muslim youths shooting Christians and burning places without any efforts to stop them,” read a PFN a press statement. The process of selecting GOCs nationwide should be open and brought under the supervision of the National Assembly, as the choice of GOC by one man does “not augur well for the peaceful co-existence of the nation,” according to the PFN. The Rev. Chuwang Avou, secretary of the state chapter of CAN, said the crisis broke out when Muslim youths pursued a woman into a church during worship on Sunday, wreaking havoc on the service. A Muslim group in the area, however, dismissed claims that Muslim youths ignited the tensions. They accused Christian youths of stopping a Muslim from rebuilding his house. The same area suffered on Nov. 28-29, 2008, when murderous rioting sparked by Muslim attacks on Christians and their property left six pastors dead, at least 500 other people killed and 40 churches destroyed, according to church leaders. More than 25,000 persons were displaced in the two days of violence. Young radical Muslims suspected in attacks on island off coast of East Africa. NAIROBI, Kenya, June 30 (Compass Direct News) – Two church buildings were razed Sunday night (June 28) on the Tanzanian island of Zanzibar after worship services. Suspected radical Muslims set the church buildings on fire on the outskirts of Unguja Township, on the island off the coast of East Africa, in what church leaders called the latest incidents of a rising tide of religious intolerance. With Christian movements making inroads in the Muslim-dominated area, the EAGT church and a Pentecostal Evangelical Fellowship in Africa (PEFA) church building a few miles away were burned down as a fierce warning, church leaders said. The PEFA church building was located in the Kibondeni area eight miles from Unguja, and the EAGT structure was in the Fuoni area six miles from Unguja. Samuel Salehe Malanda, pastor of the 30-member PEFA church, said their building doubled as a nursery school on weekdays. Construction of the PEFA church building was in the final stage of completion last week, area church leaders said, when Masoud Jecha, assistant sheikh of Kibondeni, visited it and threatened Malanda. “If you do not stop your construction, we will bring down the building,” Jecha told the pastor. Malanda said the church reported the arson attack to police, who have purportedly begun an investigation, and the congregation has also sought the help of the chief leader of the rural government. The church’s police report included mention of Muslim extremist suspects bent on stopping the spread of Christianity in Zanzibar. Church leaders said Odilo, who had donated his plot for the EAGT church building, was living in fear of the Islamic militants burning down his house, as they are known for carrying out their threats. Pastor Paul Makungu said his EAGT church has 29 adult members and 13 children. He has also filed an arson report with local police, who are investigating suspects including radical Muslims and the chief neighborhood leader. Bishop Obeid Fabian, chairman of an association of congregations known as the Fraternal Churches, said Christians in Zanzibar have received several threats. On May 9 Muslim extremists expelled Zanzibar Pentecostal Church worshippers from their rented property at Ungunja Ukuu, on the outskirts of Zanzibar City (see http://www.compassdirect.org, “Radical Muslims Drive Church from Worship Place in Zanzibar”). With no help forthcoming, church members have begun gathering for fellowship in their homes, Fabian said. In Zanzibar City on April 17, government officials ordered Christians of the Church of God Zanzibar from their rented government building effective April 19, ostensibly to pave the way for renovations. But two months later, said pastor Lucian Mgayway, no renovation work had begun, and the government has since turned it into a business site. The church had been worshipping in the building since October 2000.